Today at the funeral of two police officers who were killed in a car bomb attack yesterday in Istanbul’s Vezneciler district, a suspect whose identity has not been disclosed allegedly threw a bullet at CHP Leader Kılıçdaroğlu. The CHP leader held a press conference a couple hours after the funeral in order to raise his voice against the intimidating attack and express his determination to continue defending his opinions. “Here is the shameful part: A person walks in front of the president, the prime minister, the interior minister and throws this (bullet) at me while walking in front of me. Supposedly to threaten me with death,” he said, adding no one could stop him from his course. 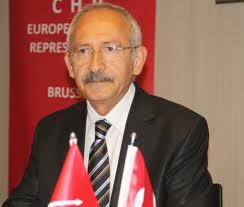 Kılıçdaroğlu also slammed the security forces for allowing such an incident, stressing the CHP would take its own security measures moving forward. “They think they can change the regime by spilling our blood. No one should consider it. One of us might die but thousands will rise. No one can stop us,” he stressed, adding politics should have no place in funerals or mosques. This entry was posted in CHPEU, Instagram, Uncategorized and tagged CHPEU, Instagram. Bookmark the permalink.